This is the continuation of a series of different 3D-Heading-Styles introduced for designing Microsoft Access Form/Report Headings. This design is a variant of the 3D-Heading Style presented under the Title Create 3D Headings on Forms. Both the Styles has its own beauty and once they are created you may copy the same Controls and customize them with different Fore-color, Font & Font Styles (Bold, Italics etc.) and use it on Form or Report Headings. Copy the following Main Program Codes given below into a new Global VBA Module in your Project and save it. This Code implements the Main Functions of each Heading Styles presented so far including this one. Once you are ready with the above you may copy the Code for this Heading Style and try it out. Copy the Code below into the same Global Module where you have copied the Main Programs, or any Global Module you prefer and save it. Press Alt+F11 to Display the Visual Basic Editing Screen (you can toggle Database and VBA Window alternatively by pressing Alt+F11 Keyboard shortcut). Press Ctrl+G (or View --> Immediate Window) to display the Debug Window. You will see the Screen flashes briefly, as if it is refreshed. Minimize the Visual Basic Window and you will find the above Heading Style created on a new Form. Besides the 3D heading on the form you will find some help text with tips to customize the 3D heading with your own heading text, Font or Font Style you like. Let us examine the Command Line Values. Shadow3D is the Function Name. 0 - Shadow is tilted to the left top corner of the heading text. Second parameter value 4 (Red Color) is the topmost label's text color. The range of color values can be 0 to 15. The QBColor codes are given on the Page with the Title: Border2D Heading Text. Third parameter value 0 creates 3D Text on Label controls. This is optional and can be omitted if you need only Label based 3D Text. When third parameter is omitted, do not use a coma after the second parameter. When this value is 1 it draws a Text Box based Design. An expression, like ="Sample Text", with default text is inserted into the Control Source Property of all the Text Box layers created for the heading. 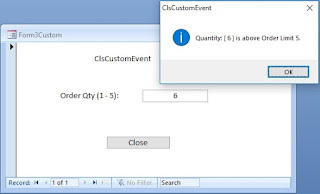 You can change the constant value in the expression with your own text, in the control source property, or change it to show values from the underlying field of Table/Query attached to the Form. Or you can write a Dlookup() Function to pick the Value from a different Table/Query. [CCode] is the Field Name where the country codes are stored in the Table/Query attached to the Form and the current value on the form is used for finding the country name. Note the single quote immediately after the equal sign followed by a double-quote and the closing single quote within double-quotes, before the closing parenthesis, indicates that [CCode] field value is character type data. Tip: Search in MS-Access Help for more details on Dlookup() Function.